Light Developer is affordable lightweight software providing an efficient solution for all photographers – from image management to editing – from touch up to re-composition. Light Developer uses unique technological solutions which will help solve those tricky problems including high quality noise reduction, complex matting, content-based manipulating and much more. The most unique function is its matting and masking functions, including “chromakey matting” and “inside/outside edge matting”. Noise Reduction: The noise reduction in Light Developer gives an different and advanced way to remove high ISO noise while keeping details. This algorithm is called ‘texture based noise reduction’. HSB Curve: The HSB curve is a curve adjusting work under ‘Hue-Saturation-Brighness’ color space that allows user set different parameters by the coordinate axis of hue value. Matting: Matting is about cut out an object from background for composition purpose. To matting an image, open it and click the ‘heart’ icon from the editor.The Light Developer provides two advanced methods and related tools for the task. Optimize portrait: There are set of tools and functions help you optimize a portrait photo: Repair and inpainting tool, Change shape tool and Digital Beauty filter to optimize skin. 16bits & Linear editing: Light Developer chooses 16 bits per channel, which is in linear space, as its internal image formats. RAW supports: Light Developer, based on dcraw lib, supports the most common RAW formats for getting their thumbnail, previewing and developing. 3D Stereo image (MPO format) maker: This merging function creates a stereo image from 2 inputs, left and right, in MPO format which can be shown on a 3D device. Optimized image size: The enlarging algorithm will enhance the edges to make them looks as sharp as the original. This is good when enlarging a graphic style image or an image with clear edge. Uncheck ‘Keep edge vector’ to disable this feature, and you will get a smooth outputting. Grayscale and Tone Maker: This function combines 3 processions together – Turn photo to grayscale with varied RGB weights in 16bits linear space, Decrease saturation based on the result of 1, Tint photo in their highlight, mid-gray and shadow part separately. 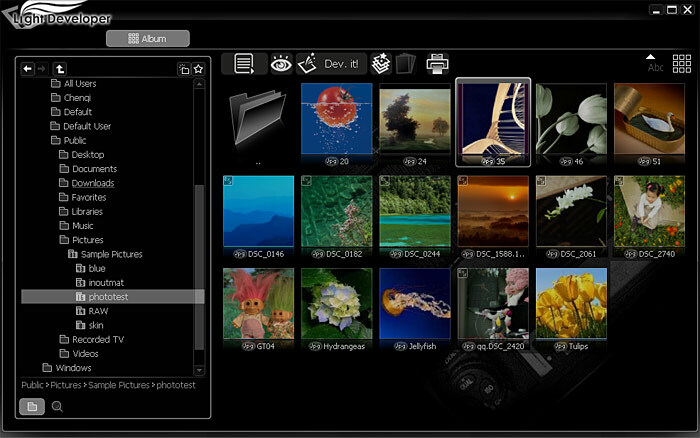 Searching based folder: The Light Developer program provides a ‘searching mode’ to navigate on your photos. Where photos are cataloged by its property instead of file system. Locally adjusting by a list of areas: A selected area is a mask over the image. Within the selection, where mask value is 255, functions and filters take effects. Outside it, no change happens. Smart erase: Smart EraseThe ‘smart erase’ function is automatically version of ‘camera paint’ tool, which copy pixels around the object, and paste on it to erase/cover it. This function is useful when you want to remove a unwanted object from the photo, for example, a extra person coming into the view. Apply steps: When you have serials of photo with same problems, you don’t need processing them one by one. You can open the first photo to refine it, then apply to others. Advanced jpeg optimizing and saving: As we know Jpg format is a compression with varied compression ratio. The quality parameter from 0 to 100 controls the final file-size and quality. A low quality such as ‘5’ can get a highly compressed file with poor quality. On the contrary, high quality like ‘95’ output a big file with good quality. You can download trial version of Light Developer from the following links. Light Developer costs 79 USD and can be purchased using this link. You can get 100% discount for a limited time at Giveawayoftheday.